Jabong.com trumps Flipkart traffic – Offers Door Step Card payment service for COD! 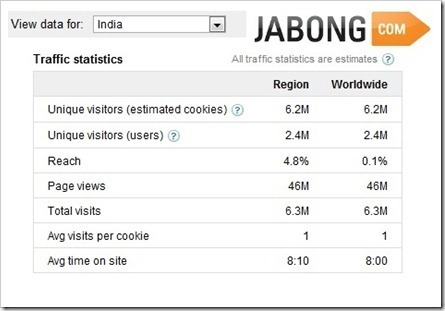 Jabong.com is now the most trafficked Ecommerce site in India if Google numbers are to be believed. Rise of jabong.com has shaken up the E-Commerce market in India – Their rise has been nothing but meteoric. Here is comparison between Jabong.com & Flipkart.com just to give you an idea where Jabong stands currently in Indian Market. If you see the Unique visitor count, Jabong.com is attracting close to 50% more traffic than Flipkart.com which is phenomenal given that jabong.com has only been in market for about 9 months. Yes, obviously they are investing piles of cash in advertising, but they are also backing it with up with great service. I have ordered 3 times via jabong.com and my experience has been absolutely brilliant. They offered great prices, great variety for most of their products and best of all, their customer support has been top notch. For a new site like Jabong, to get all the processes and people in place in such a short time is really commendable. The biggest (positive) surprise for me was when I ordered new pair of shoes through Jabong recently. I am one who never orders Cash on Delivery, I never have. But during last order, I (by mistake) ordered COD. 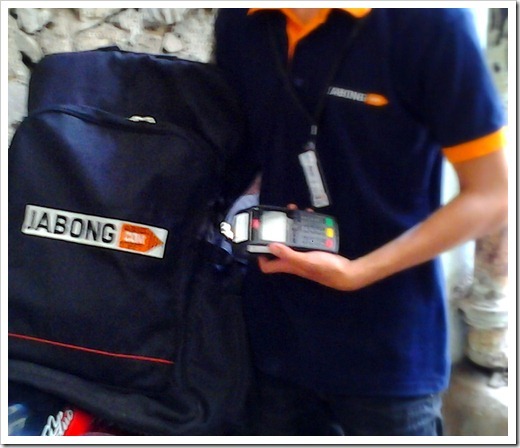 When the Jabong courier boy came for delivery, I was pleasantly surprised when he said “ You can pay me by Cash or Card”. One of the major problems most ecommerce sites face with CoD orders is that customer may does not carry cash at time of delivery. Here, the jabong delivery boy took out the nifty GPRS enabled card reader, swiped my card and handed me the reciept. I was literally bowled over. Now, I am not sure if Flipkart or other ecommerce sites offer this – but for me this was a first. I thought Cash on Delivery means Cash on Delivery not Card on Delivery! Jabong has left me as one impressed customer – Kudos to them! Look deeper, the difference between uniques is not too much. Also pageviews and average time spent is higher on FK, says something about the quality of users on FK. Will someone tell me why people use card at doorstep and not on website? Flipkart has good variety but jabong is still my favourite because of all their offers and discounts. Card on delivery is really a good service started by ecommerce portals like jabong.com as it provides a feasable option of payment to the customers. That is good idea. 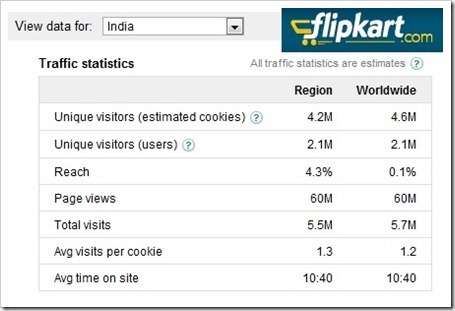 But I saw both site traffic in alexa Flip-cart have higher traffic in India & globally! yes your data is showing more traffic & visitor on Jabong. Very good insight and preview I also shopped form Jabong, its a good site. The traffic has to go high as the products and delivery time is superb. ya I also tried stackkart.com overall experience is good. and it's providing cod facility where other sites are not able to give that facility. Stackkart.com Finally I get my book from here of Ramesh Publisher I can’t find any where my M.A Du Book and thanks to Stackkart for providing me this book I am the customer of Flipkart. But I don’t get Discount from Flipkart. I don’t know what happen with Flipkart. Firstly the book are out of stock, secondly I can’t imagine that they are not giving any discount this is too much. But I find this book on Google. Then I get this Stackkart.com Website name . And they delivered book within 2-3 days. I hope in future that books are available on Flipkart.com. Once again Thanks! to stackkart.com team for providing this book. This Riya character from Myntra is a fake. They use this name when they send out mailers to customers. Myntra surely does NOT offer Card on Delivery. I have placed an order with them in the recent past (from Noida) and can bear testimony to that. Also, I think one should be a little more reserved about making such sweeping statements about the availability of a service. Providing this service costs serious money – this EDC machine costs about a lakh! and surely no one can afford this unless they have substantial order volume that necessitates setting up of logistics operations at a specific location. Most certainly there are no Indian ecommerce companies that have reached this threshold outside the metros, as yet. All things considered, the % of orders on which Card on Delivery is being offered today is not more than 20% for any company which shows that though, it is a step in the right direction, there is still a long way to go for the issues and inconveniences associated with COD to be surmounted. Oh yeah, even I've got a bitter experience from Flikart, I bought an expensive phone at a very cheap rate and when it was delivered, the camera was not functioning, also the OS (Anroid) cannot be upgraded, when showed to local shop, they said it was bought from abroad something similar to an unlocked phone, now I got to know why they r selling it such cheap rates..
What was surprising in this article was the fact that you presented this “unique offering” from Jabong without even researching if Myntra, Flipkart or others are offering the same service (which both of them are, along with few more). Based on the way this article was presented, I am forced to ask this – Was this a paid article? Also, where have I said it is an unique offering? For me it was a first. Also, I checked Flipkart’s as well as couple of other sites shipping documentation and they have not mentioned that they will be offering Card swipe on COD. So it gave me an impression that such facility is not available… My order went as COD, without me realizing it…and hence I came to know about it and was surprised and hence decided to write about them..
Shweta, I am not sure how many times to tell this… Like I have mentioned in the article, I was not sure about who all offers Card swipe on COD. This was the first time I ordered COD and I was surprised to see it… It is really nice to know that others also offer COD. I never tried them because of full satisfaction with the eBay and Flipkart services but now when I know that Jabong will deliver on card payment at door step then must give a try to this new idea, it will also protect me from the sun burn when other delivery boys calls and says that they are coming and I use to visit nearest ATM to withdraw the amount in mean time. There is hardly any reason for competition between Jabong and Flipkart. While Flipkart focusses more on products like books, gadgets, movies, games etc., Jabong offers clothing and lifestyle products. There is hardly any overlapping of their inventories. And if you are able to bring Surprising smile on the face of a customer you make a customer advertising banner. Slowly over a period of time. You dont need advertising because people themselves are your hoardings and banners. Great that card on delivery is unique and fantastic initiative by Jabong and the chunk of advertisements they are showing on internet is really fantastic. They hold the nerve now of the target segment and sure they are going to give sleepless nights to Flipkart and similar other sites of this industry…. My experience with both websites is quite good bt on comparison I feel flipkart’s service is better than of Jabong’s. They also accept card payment on delivery and it’s brilliant. Not only flipkart even zopnow and most other ecommerce sites take card on delivery(COD).Its not a big deal.By getting funding and burning huge money on ads will certainly increase traffic.The point is when they have burnt all money on marketing and still attract similar traffic then we can compare. Flipkart has been accepting card payments on CoD for months now.